[128 Pages Report] The CSP LED market was valued at USD 632.8 million in 2017 and is expected to reach USD 1,744.8 million by 2023, at a CAGR of 18.2% during the forecast period. The base year used for this study is 2017, and the forecast period is 2018–2023. Traditional LEDs usually undergo from the chip/die manufacturing to packaging processes where the die would be attached to an interposer such as a ceramic substrate, yielding a packaged LED or what is commonly referred to as an LED package. In the case of CSP LED, separate steps of having manufactured chips going through a packaging line are eliminated because at the die-level itself the chips are singulated and coated with phosphor. Solder or bond pads are installed at the wafer level just after the epitaxial stage of manufacturing using semiconductor etching and metallization techniques. CSP LEDs become ready for installation on a PCB after the wafer is diced. With no substrate and alloy/bonding wires to solder, CSP LEDs effectively omit production processes, which reduce the probability of making defective products. With several of the packaging steps omitted vis-à-vis a traditional LED package, the cost potential of a CSP LED is significantly lower, with a low bill of materials. 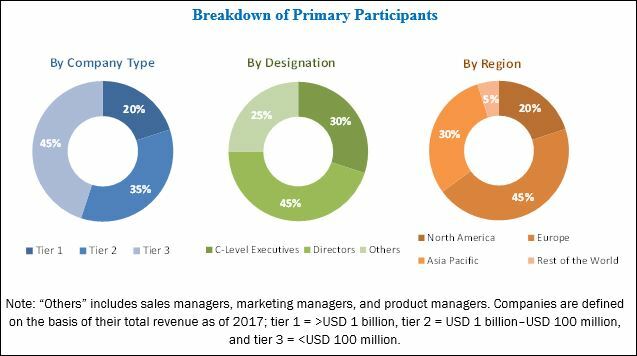 To provide market size estimation for North America, Europe, Asia Pacific (APAC), and Rest of the World (RoW), along with respective countries, segmented on the basis of each application. The research methodology includes the use of primary and secondary data. Both top-down and bottom-up approaches have been used to estimate and validate the size of the market, as well as the other dependent submarkets. Key players in the market have been identified through secondary research. Secondary sources include references such as annual reports, company press releases, Factiva, and investor presentations of companies; white papers, consumer electronics exhibitions, certified publications; websites; directories; and databases. All the percentage shares and breakdowns have been determined by using secondary sources and verified through primary sources. All possible parameters that affect the markets covered in this research study have been accounted for, viewed in extensive detail, verified through primary research, and analyzed to get the final quantitative and qualitative data. The breakdown of the profiles of the primaries has been depicted in the figure below. The value chain of the market includes input suppliers of wafers, manufacturing equipment, phosphor, and other raw materials; die/chip manufacturers, module integrators, and brand customers (end product manufacturer). Some of the major companies operating in the market are Lumileds (The Netherlands), Samsung (South Korea), Seoul Semiconductor (South Korea), LG Innotek (South Korea), OSRAM (Germany), Nichia (Japan), EPISTAR (Taiwan), Cree (US), Genesis Photonics (Taiwan), and Lumens (South Korea). How much growth is expected for display backlighting application in the CSP LED market, and what would be the impact of the declining LCD display panel market on CSP LEDs? Which are the top use cases/applications/industries of CSP LEDs to invest in, and what are the untapped opportunities? How the demand for CSP LEDs will shape in the next 5 years for automotive and general lighting segment? Chip-scale package (CSP) LEDs are the latest trend in the LED package market. According to IPC's standard J-STD-012 (implementation of flip chip and chip scale technology), to qualify as chip scale, the package must have an area no greater than 1.2 times that of the die, and it must be a single-die and direct surface mountable package. As of 2017, CSP LEDs have only penetrated 4% in the global LED package market valued at USD 16 billion in 2017; with low-cost potential and attractive features, CSP LEDs are expected to penetrate about 10% of the total LED package market by 2023. The CSP LED market is estimated to be USD 757.7 million in 2018 and is likely to reach USD 1,744.8 million by 2023, at a CAGR of 18.2% between 2018 and 2023. The shipment of CSP LEDs is expected to cross more than 15 billion units by 2023, at a CAGR of about 30% during the forecast period. The low-cost potential of CSP LEDs with a low bill of materials, which is because of the manufacturing process, where several packaging steps are omitted, is a major factor driving the growth of the CSP LED market. 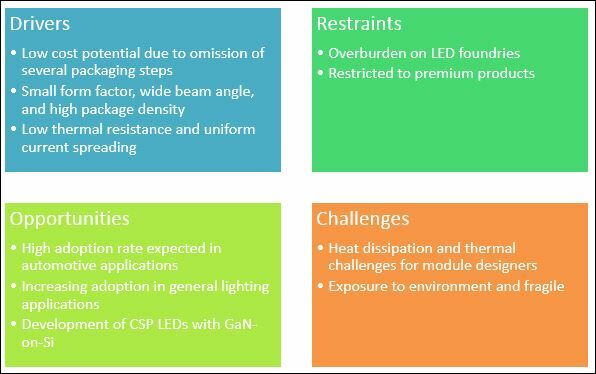 Small form factor and wide beam angle due to high-package density coupled with low thermal resistance and uniform current spreading are other factors that are contributing significantly to the adoption of CSP LEDs in different applications. The display backlighting application is expected to dominate the CSP LED market, in terms of market size, during the forecast period, as it is pulled by the demand for energy efficient and compact backlighting sources for TV, monitor, and smartphone displays. The adoption of CSP LEDs in general lighting and automotive applications will play a crucial role in the growth of the market during the forecast period. Demand for CSP LEDs is expected to increase rapidly in next 5 years mainly from automotive and general lighting segments, and these two applications will provide tremendous growth opportunities to CSP LED manufacturers. The market for automotive is expected to grow at the highest CAGR during the forecast period. There is negligible adoption of CSP LEDs in the automotive segment, majority of which is in replaceable headlights that are being supplied by local/regional vendors by utilizing CSP LEDs from manufacturer like Seoul Semiconductor. Though the market size for CSP LEDs in the automotive segment is very small currently, it is expected that demand for mid- and high-power CSP LEDs will increase exponentially 2018 onwards when automotive manufacturers and automotive lighting suppliers start adopting CSP LEDs for new installations. APAC accounted for largest demand for CSP LEDs mainly due to the presence of leading CSP LED manufacturers and customers (i.e. smartphone vendors, backlighting panel integrators, and display panel manufacturers) spread across countries such as South Korea, China, Japan, and Taiwan. The CSP LED market witnessed high demand from display backlighting, mobile flash, and other applications in APAC. CSP LEDs reduce the total number of LEDs required per backlighting panel, along with the form factor of the BLU. The growth in APAC will also be driven by the rise of newer CSP LED applications in general lighting and automotive. The market in Europe is likely to exhibit the highest growth owing to expected high demand for CSP LEDs in automotive and general lighting applications during the forecast period. 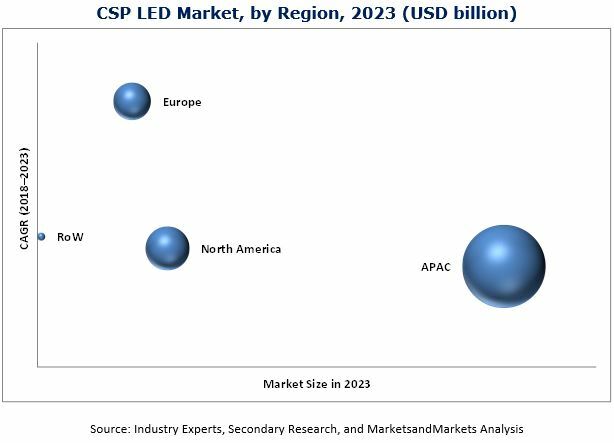 The presence of a large number of automotive manufacturers, key CSP LED suppliers, and major general lighting customers in the region will drive the growth of the CSP LED market in Europe; and the automotive segment is likely to lead the market in the region by 2023. Overburden on LED foundries and so far adoption only in premium products are restraining the growth of the market. Heat dissipation and thermal challenges for module designers pose a major challenge to the market. Samsung is focused on the development of CSP LEDs with GaN-on-Si, which can further reduce the cost of CSP LEDs for different applications and offer strong competition to traditional LED packages. Such developments are major opportunities for CSP LED manufacturers to grow in the market. Companies such as Lumileds (The Netherlands), Samsung (South Korea), Seoul Semiconductor (South Korea), LG Innotek (South Korea), OSRAM (Germany), Nichia (Japan), EPISTAR (Taiwan), Cree (US), Genesis Photonics (Taiwan), and Lumens (South Korea) are the major players in the market.